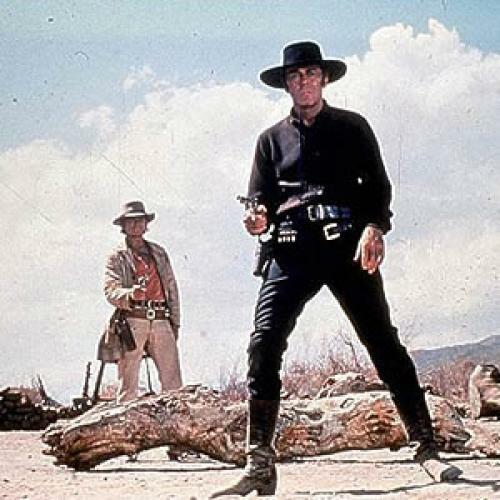 The Hollywood Western, as a genre, is a realm of fantasy. Once Upon a Time in the West is, in its pseudo-realistic way a fantasy superimposed on that general fantasy. There is something touching and maniacal about the two-and-three-quarter- hour result. Leone’s adoration of all the standard props and décor—the horses, the saloons, the guns, the clenched jaws, the histrionic taciturnities—has a childlike wonder about it. I almost felt that I was sitting next to little Sergio, aged 10, watching him gape wide-eyed at his own film. But only a fanatic could have taken such a stale Western plot and lavished all this bated-breath, minutely detailed attention on it. His picture is fictitious from Moment One, reminiscent of hundreds of films and dozens of directors, but it is made with such fervor, such conviction of its importance, that in some crazy way it holds the interest. Well, for the first half or so, anyway. Then I felt myself grinning at Leone’s persistent, cornily talented infatuation with the patently incredible. The underlying cheerful insanity is that, although many of the actors are American and some of the exteriors were shot in Utah and Arizona, the picture is really Italian. Some of the leading actors are Italians who are dubbed into English. Gabriele Ferzetti, the architect of L’Avventura, camps away as a villainous crippled tycoon. Paolo Stoppa, of Miracle in Milan, is a livery driver with Chic Sale chin whiskers and accent. Claudia Cardinale, whose decollete adds more hills to the Utah landscape, has been dubbed, too—which is a bit of a puzzle since she is supposed to be from New Orleans, the usual cop-out for a Western character with a foreign accent. Even Charles Bronson, the American who plays the Silent Stranger, can be called an Italian phenomenon: one more subsidiary American actor who became an Italian star. That’s not all. The whole huge panorama is seen through foreign eyes. No matter what time of day it’s supposed to be in a scene—morning, noon, or dusk—the light is Mediterranean gold. Tonino Delli Colli, the cinematographer, has covered everything with melted parmigiana. Every setting, no matter how stark it is supposed to be, finds a way to be ornately stark. For instance, in an isolated railroad station at the opening, the telegraph wires on the agent’s battered desk are fixed in rococo curlicues. The score by Ennio Morricone suggests how Puccini would have written his Western, La Fanciulla del West, if he had done it about 1935. Broad lyric themes, right out of La Scala, accompany violent gunplay and dusty confrontations. This Western has the first shootout in which I expected the duellists to burst into bel canto. The story could have been told, as it often has been, in 80 minutes or so. But, in his editing, Leone anatomizes every scene into its components, expanding small incidents into small dramas: for example, a sequence in which water drips on Woody Strode’s head, then his hat, is made into a little pantomine of stolid humor. It’s Leone’s intensity with these details of editing, his concentration on small stuff, that gives the picture what interest it has. When it gets into the plot lines and personal relations, when it gets figuratively off the movieola and on to its feet, the picture reveals how thin it is. But for the first hour or so, the loving care that Leone gives it is so tender—even in the many killings—that it is almost breathtaking. I was wonderstruck at it, not by it.